Email is still the primary way people communicate online. So giving your readers an easy way to contact you via email is essential for any successful blog or online business. Today I will show you how to get free email hosting for your domain. When running a blog it’s always good to present your audience with a professional image. One important factor which is often overlooked is the email address that’s used as the blogs main contact email. Time and time again I see these email addresses ending in @gmail.com or @hotmail.com. It really doesn’t give a professional feel to the site. It can be expensive to get an email address for your domain but the good news is it doesn’t have to be. In fact if you read the rest of this post I’ll show you exactly how to get email hosting for your domain completely free. For our free email hosting we are going to be using Zoho Mail. Zoho Mail offers email hosting services for up to 25 users completely free. First we need to sign up to Zoho Mail. 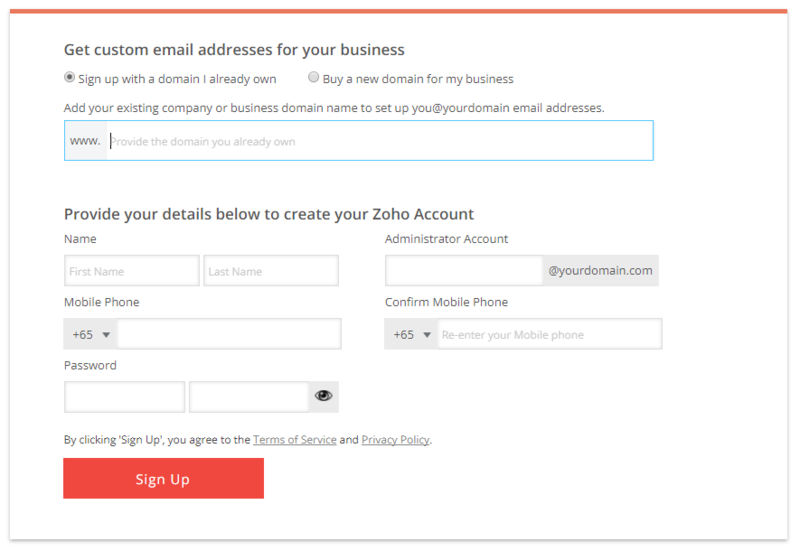 Visit https://www.zoho.com/mail/ to get started and select Business Email and click the “SIGN UP NOW” button. On the next page you’ll be shown the different price packages which are available along with the features they offer. Click the “SIGN UP” button under the FREE account. Next you’ll need to fill in your domain information along with your personal details including your phone number. At this point you also need to choose the name for your administrator account. Your administrator account will have the ability to create new users in the future. Once you have filled in all your information press the “Sign Up” button. Zoho will send you a SMS to verify your account. Enter the SMS you receive on the screen that appears and press the “VERIFY MY MOBILE” button. After your mobile has been verified your Zoho Mail account will be created. Next we need to configure Zoho Mail. The first step in the configuration process is to verify the ownership of your domain. This is done by adding a record called a CNAME to your DNS. Zoho Mail comes with instructions on how to do this for most of the major DNS providers. If you’re unsure who handles your DNS it’s usually provided from the company you registered your domain with (Domain Registrar). Click the drop-down menu and select who you domain registrar. If your registrar is not there then select Others to view the general instructions. Follow the instructions and add the CNAME to your DNS. Once you have done this click the “Proceed to CNAME Verification” button to complete the verification process. After your domain has been verified successfully you will be asked to create your first email account. This email account will be the Administrator for your Zoho Mail. Using this account you will be able to add new users in the future. Enter your desired account name and click the “Create Account” button. Next you will have the option to add more users if you wish. For now I recommend to skip this step by clicking the “Skip” button located at the lower right of the screen. Zoho Mail allows you to group a set of email accounts together that’ll receive email via a common email address. Think of a Zoho Mail group the same as a distribution list. For now we will skip creating a group by clicking the “Skip” button located at the lower right of the screen. This next step is very important as you will configure your DNS email settings (called MX Records) to point to your new Zoho Mail email servers. Warning: If you are already using email for your domain, once you make these changes you will no longer be able to receive email via your existing email server/accounts. If you are setting up a brand new domain you most likely wont have any existing MX records. Add the following 2 MX record entries into your DNS. Zoho Mail provides many instructions on how to create the MX records in your DNS for most of the major domain providers. 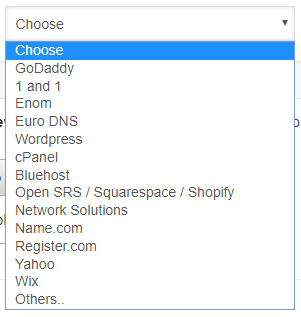 Click on the “Choose Your Domain Provider” drop down list and select your domain registrar. If you don’t see it then proceed with the generic instructions shown instead. Finally head back over to your domain registrar website again, open up your DNS records and follow the instructions provided. If you are already using email with your domain it means you will already have your MX records set in your DNS. You will need to update these records. The process is the same as above but you’ll need to remove the existing records first. Don’t add the new Zoho Mail MX records without removing any existing MX records. Once you have updated your DNS with the new Zoho Mail MX records you need to verify your changes can be seen by Zoho. You do this by clicking on the “MX Lookup” button. Note: It can take up to 24 hours before your DNS records are fully updated around the world but now-a-days this process is usually quite quick. 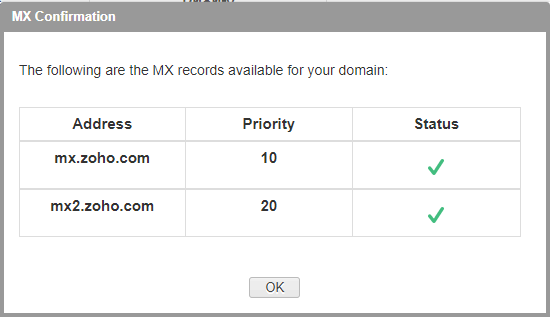 When I setup my email hosting with Zoho my MX records were verified in a couple of minutes. Once your MX records are configured correctly, “MX Lookup” will return the following confirmation message. Once confirmed click the “OK” button to close the popup window. Then click the “Next” button on the bottom right of the screen. As I’m sure you’re aware there are many dangers online now-a-days. It’s important to make sure you setup as much protection for yourself and your blog or business as possible. When it comes to email this means configuring 2 items called SPF and DKIM. Both SPF and DKIM are DNS entries which you will need to setup at your DNS host. To setup your SPF record create a new TXT DNS entry with the following details. If you are already using email for your domain you may already have an SPF record present. If this is the case you can just add the include:zoho.com part to the beginning of your existing SPF record, after the v=spf1. Once you have added your SPF you can verify it by using the online tool found here. Enter your domain name in the first box and press the “Get SPF Record” button. On the results page you should see your SPF record along with a result which will be something like “SPF record passed validation test”. DKIM stands for DomainKeys Identified Mail and is another way to verify the identity of the mail sender. Click the “Proceed to Configure DKIM” button and you will be sent to the DKIM configuration page. You will see your domain name along with a status icon (which will be grey at the moment) and an Edit icon. Click the Edit icon. On the next screen click the “Add Selector” button. Next you need to create a DKIM selector name. You can pick any alphanumeric name you like but to keep things simple I suggest you name your selector “zoho”. Enter “zoho” into the Selector Name field and click “Save” button. Once you have saved your selector name a DKIM record will be generated for you as shown below. The final step of setting up your DKIM record is to add it to your DNS records. Log into your DNS provider and create a new TXT entry with zoho._domainkey as the name and add in your generated DKIM record as the value. The final step is to verify your DKIM record by pressing the “Verify” button. If successful you’ll see the message “Selector Verified” at the top of your screen. Be warned it shows only briefly so you may miss it! Once you have verified your DKIM record click the “Back to Setup” button at the bottom of the screen. Note: It’s important to take the time to setup SPF and DKIM records as some mail servers will flag mail without them as spam! Zoho Mail gives you the option to migrate your existing mail to their service. For now this is outside the scope of this tutorial so proceed by pressing the “Skip” button at the bottom right of the screen. The email configuration page gives you all the details you need to configure a desktop mail client to connect to your new email account. For the time being take note of these details and click the “Next” button at the bottom right of the screen. Zoho provides great mobile apps for accessing your new email account. The apps are available for both iOS and Android. You can go ahead and download as necessary and log into your mail account with your new email address and password. Finally click the “Skip” button at the bottom right to continue and on the next page click the “Go to Control Panel” button at the bottom of the screen. Note: Once you get to the control panel, don’t worry if you receive a message saying no SPF record configured for your domain. It can take 24 to 48 hours for the DNS entries to fully register. Congratulations you have completed the setup for Zoho Mail and can now enjoy free email hosting for your domain. You can now access your new email account and add additional users as you wish. Remember with Zoho Mail you can add up to 25 users for free. If you have tried Zoho Mail, know of any other free email hosting providers or have any questions or comments please get in touch in the comments section below. If you liked this post and found it useful please share it with other.